Chicago, IL - As the buses reached their destination, excitement built around the arrival of our guests. We were so fortunate to experience the voices of the student Choir of the Theological Faculty of the University of Belgrade. On Wednesday, September 10, over two hundred Orthodox faithful were seated in Holy Resurrection Cathedral waiting for the beginning of what became a very memorable event. The students of the Theological School of the Univeristy of Belgrade made the trip from Serbia, to sing and chant hymns of our faith. We also were blessed with the presence of Metropolitan +CHRISTOPHER, Bishop JOANIKIJE from Serbia, Bishop LONGIN and Bishop MAXIM. Several of our guests were Clergy, not only from our Serbian Churches, but from the other Orthodox jurisdicitions in the Chicago area. 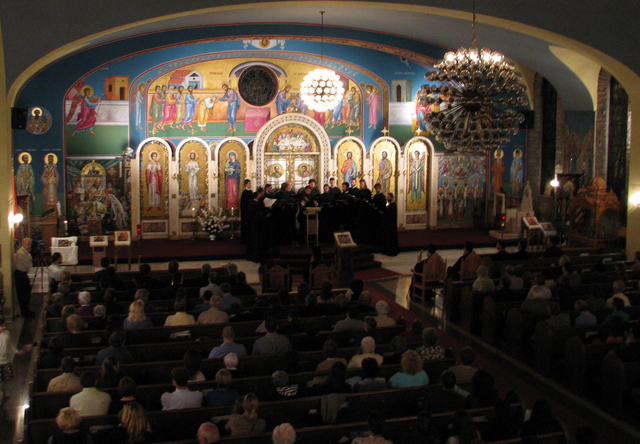 The concert began with the Troparion of the Resurrection – Christos Voskrese, Christos Anesti and Christ Is Risen – sung in all three languages, and reminding the faithful of how beautiful this hymn is when sung on Easter. Several other hymns were chanted as well with deep harmony that emanated from our Iconostasis. This beautiful program was moving and spiritual. We hope to have more events like this – providing the faithful with many opportunities to experience our faith. Orthodoxy is symbolic and allows one to use all of their senses. This evening, we were able to hear a beautiful gift that we will cherish for many years to come.